In my Kidney Stone series, Part One talked about the horror of my first stone which began to pass from the kidney and got exactly as far as the very top of the ureta leading from the kidney to the bladder before incapacitating me and provoking a dear love of morphine. Part Three will cover the intervention strategy I will follow to reduce the risk of future stone formation and provide all the resources I am finding useful to understand kidney stone formation risk factors and mitigation. This is Part Two and covers the experience of living with a Kidney Stent and the surgery to remove two stones and the stent. Oh yes, and the very best joke played by a nurse. Seriously. A really very good joke. Read on. Stents installed for kidney stone patients are very similar to drinking straws. 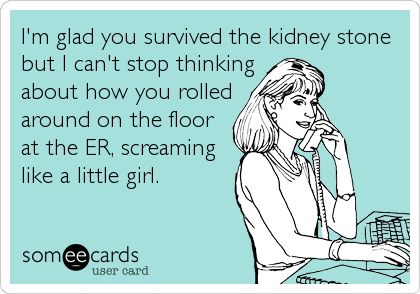 Mine was placed between my right kidney and bladder for the purpose of allowing fluid to drain through it from the right kidney. This was effectively a workaround for the blocked ureta. The stone could not be removed because the ureta was highly inflamed. The stent needed to be left in place for several weeks in order to allow inflammation to subside. Then a second operation would remove both stones. Whilst in place medical advice is to avoid any strenuous activity as this may cause irritation & inflammation. I experimented tentatively and found that I could not comfortably cycle and definitely could not run or cross-train. Even uphill walking was noticeably irritable and was followed by an increase in discomfort and some pain. Yoga was a no-go because the bending and twisting just were not agreeable. My normal exercise routine has me cycle-commuting twice per day, performing some form of Tabata-style high intensity interval training once or twice a week, one longer metabolic conditioning session and two high intensity full body resistance sessions per week. Oh, yoga too. Going from this routine to being borderline sedentary was very, very tough mentally. Once before I have had a complete layoff from exercise for several months and found the experience very unpleasant. I felt far less happy and confident. I felt that I had lost a significant part of my identity. I went from being a sporty, fit & healthy guy to being . . . none of those things. I have been fortunate or skilful or both within my lifelong fitness routine. I have had very few injuries and almost never get sick. So for years I have enjoyed being able to follow a routine without unplanned breaks. On rare occasions I have had enforced breaks I have typically fallen, hard, into the trap of attempting to return too fast and too hard and as a result actually set back recovery. I was extremely mindful of this trap this time and so eased back into exercise. I discovered one form of activity that did not appear to cause any discomfort or pain – resistance work with weights – so long as the motions did not include bending or twisting. So during the stent-period leading to my second operation I tried to walk and climb stairs as much as possible, performed low intensity resistance work and continued to eat healthily. I definitely did lose strength, conditioning and gained some body-fat nevertheless. I had my stones removed via Ureteroscopy performed under general anaethestic and followed by a single night in hospital. The hospital – London Bridge – wowed me by having a better and more extensive range of gluten-free food on their menu than most restaurants. The stones were successfully removed. There was a new stent left in place after the op but this one was removed the next day. And here comes something that I cannot help but smile broadly about whilst writing. The old stent was entirely internal and removed during surgery. The new stent had a string tied to it leading outside the body so that it could be removed by pulling on the string. The very idea of this was horrifying to me. Given how incredibly painful it was to pass urine I could not really imagine how much more painful it would be to have a string and stent pulled out through the same tube. I imagined it would be *very* painful. As a young kid with a BMX I once got thrown into the air from my bike and landed very solidly onto the upturned handlebars Landed testicles first. I needed stiches, no kidding. The nurse looked at me and asked . . .
Are you ready for me to start now? Oh what the deuce? Seriously?